Need a New Year’s gift? Name a star! Give a gift that lasts forever! Feel good knowing you’ve given the most original New Year’s gift in the universe! NEW: Let the recipient name their own star! Online Star Gift: What will you receive? OSR Gift Pack: What will you receive? OSR Gift Card: What will you receive? My boss had a special New Year’s present up her sleeve for our department at the end of last year. She registered stars in the Online Star Register for everyone, and included a personal message on the certificate. We thought this was a really original New Year’s present. You’ll find the ideal New Year’s present at Online Star Register. While the rockets are shooting towards the stars during the New Year’s celebrations, give yourself a star present. With Online Star Register you are giving a unique and individual present that will remain with for a long time as a New Year’s present. Hi OSR! Just wanted to convey my heartiest thanks for the beautiful star coordinates sent to my niece in Canada. I was worried that my New Year gift will be delivered late but due to your fast delivery service, my niece opened her New Years Eve gift on the 1st of January. I will recommend your site to all my friends and will certainly be making use of your service again. Thank you! I just wanted to write to say thanks for the absolutely wonderful gift for new years! As new years eve gift, my husband Marc gave me a beautiful envelope which very surprisingly has the coordinates of the star named after me. Now that I have found OSR, I will certainly be using your services and the fact that you were able to add an elegant happy new year wrapping with it is absolutely amazing. Thank you so much! My wife Karen has received the package right on time for the New years eve. I am amazed at your warm customer service and fast delivery process. My new year gift to Karen took her by surprise and she was absolutely delighted by its beautifully wrapped package. Thank you once again for the best new years eve gift! One Million Stars: Name a star for someone special and see it in 3D immediately after ordering your gift! This star will brighten your future at all times! Happy birthday! Your star has the most amazing colours! Discover the universe from the comfort of your own home with the One Million Stars App. It’s a revolutionary way to travel the stars from your web browser. The One Million Stars App allows you to view one million stars, including stars named by astronomers, as well as personalized stars named in the Online Star Register (OSR). Fly through the universe and experience the stars and the galaxy in 3D! 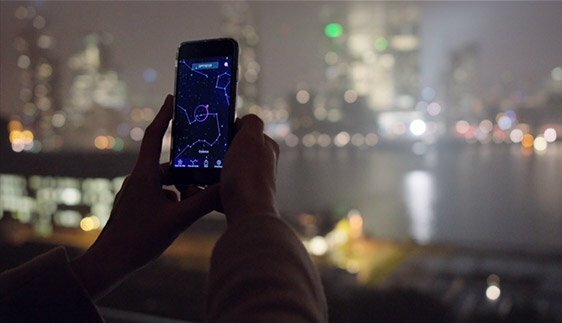 The Online Star Register offers a FREE mobile app for iOS and Android to locate stars and constellations in the night sky. Naming and finding a star registered with the Online Star Register (OSR) is even easier with the Star Finder App. Pinpoint a specially named star’s location in the sky with a unique star code, or browse constellations based on your location. 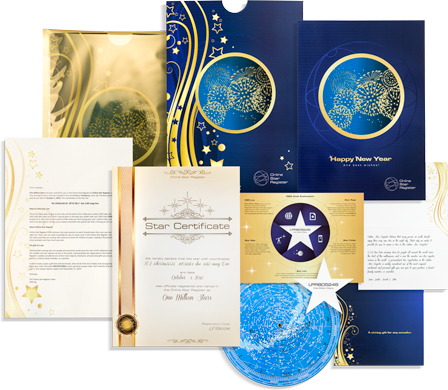 The Online Star Register (OSR) offers customizable gifts that are perfect for colleagues, clients, and more, for a variety of occasions. Naming a star in the Online Star Register is a one-of-a-kind gift that they’ll never forget. 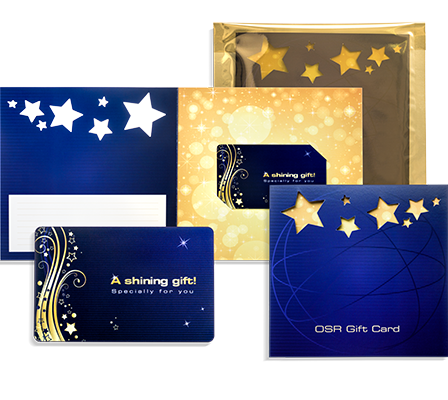 With our corporate gifts, you can name multiple stars, or you can allow each recipient to name their own star with the OSR Gift Card. For each product, we facilitate bulk orders and fast shipping! Looking for a unique way to celebrate the coming of a new year? There is no more heartfelt or unique a gift in the universe than naming a star with the Online Star Register! The New Year is the perfect time to celebrate the years that have come before, while looking forward to the years ahead. There’s no better way to celebrate the past and the future than with a specially named and dated star in the night sky. 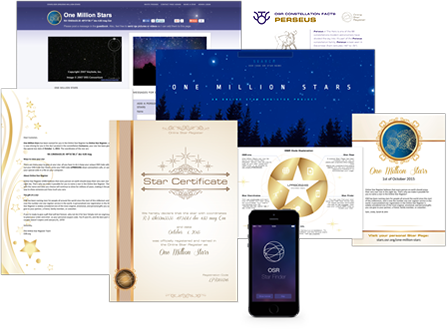 The best part is, all of our gifts come with the ability to find your new star in the sky with the breathtaking One Million Stars project and with the OSR Star Finder App. It will even come wrapped with New Year’s gift wrapping! In order to ensure you can see your star for many new years to come, new innovations in OSR’s star finding technology will automatically be added to your original gift pack for FREE. View your star with the OSR Star Finder App! 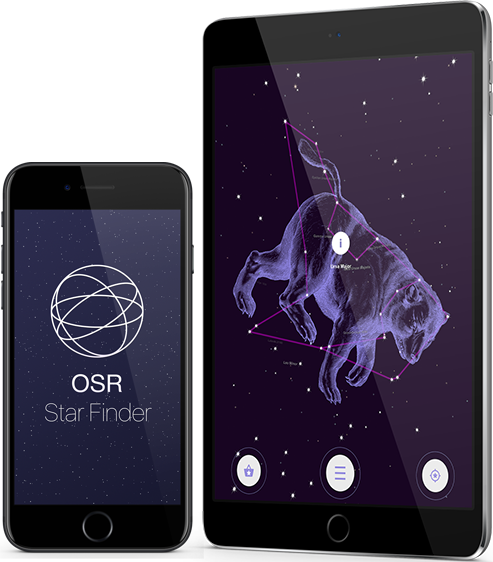 Search, locate, and gaze at your own star with the OSR Star Finder App. You can download the app for FREE in the AppStore or the Play Store!